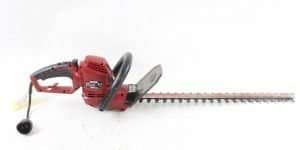 Redmax is a manufacturing company that produces blowers, brush cutters, hedge trimmers and more. The company prides itself on the development of powerful but environment friendly products. The company itself is owned by Husqvarna, which goes to show that Redmax was creating products considered quality enough for an even older and more successful company to want to work with them. 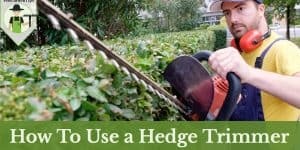 Many of the red max hedge trimmers have double-reciprocating blades. 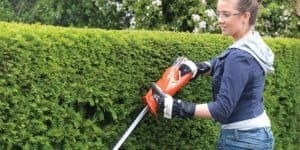 Redmax provides trimmers of three different varieties including single-sided blades, double-sided blades and long-reach hedge trimmers. With so many options, they are sure to have something that will meet your needs. 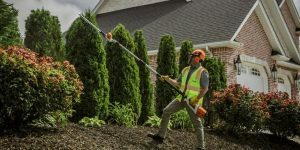 Most Redmax trimmers also make use of a patented clean-combustion Strato-Charged engine technology, which allows Redmax hedge trimmers to be up to 20% more fuel efficient than other gas-powered trimmers. The Strato-Charged technology itself was developed in 1998 and comes with a wide variety of benefits both to you and the planet. Redmax began in 1910 under the name “Tokyo Gas Kogyo Company,” making it an over 100-year-old business. You know a company with that much experience is great at making products that people continually want to buy, otherwise they wouldn’t have stayed in business for so long. As of 2007, Redmax has been owned by an even older company, Husvarna. Combined, the two companies have made a lot of progress creating quality products over the past 10 years. Eventually, both Redmax and Husqvarna found themselves in the United States, selling products to companies all over and keeping customers happy. 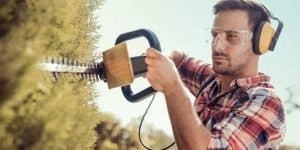 Today, Redmax are the creators of some of the most environment-friendly hedge trimmers as well as other outdoor tools such as blowers, brush cutters, and edgers. They have developed their Strato-Charged technology, which allows their products to run more quietly, produce a lower level of emissions and be more fuel efficient. Redmax employees work tirelessly to reduce the impact of their tools on the environment. Currently, Redmax has dealers all over the United Stated as well as Canada, making it easy to find their products. In modern times, designing products that have little to no effect on the environment is incredibly important. 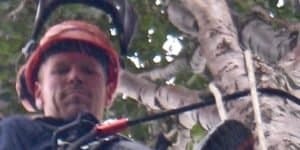 Largely, those who often work in nature are well aware that without some level of environmental awareness, it would only be a matter of time before products like those sold by Redmax become obsolete. 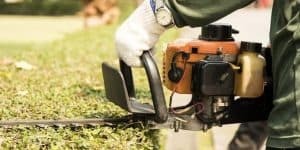 Many companies that make gas-powered products are aware of this factor and take steps towards fixing it, but creating an electrically-powered trimmer that can measure up to the level of power you can get from the gas powered variety can be problematic. This is why Redmax has developed a technology that allows them to build gas-powered tools that are not only going to cause a lot less of an impact on the environment, but also are a lot more convenient to use as they are more fuel efficient. This combination helps to save the planet and save you money at the same time. This trimmer comes with a 30” single sided blade and a 23.6cc motor. 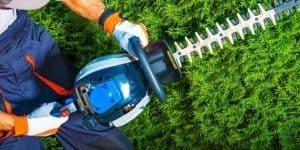 Due to the Strato-Charged technology, it releases ultra-low levels of emissions, making it much safer for the environment than a lot of the gas-powered trimmers. This trimmer also comes with steel-needle bearings and a vibration dampening system on the rear handle to keep you comfortable as you work. 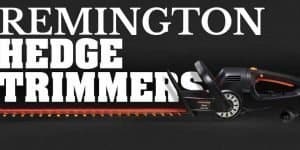 This trimmer has an 18” cutter bar, which unlike the previous model, is double-sided, giving you the ability to easily work in multiple directions. This model also comes with an adjustable 3-position rear handle, allowing you to keep a steady grip regardless of which direction you’re moving. It also has a safety bar to help eliminate the possibility of a leg injury during use. This trimmer comes with a 21.7cc motor sporting Strato-Charged technology. This is a long-reach trimmer with a 23.6cc motor and a 20” double-sided blade. 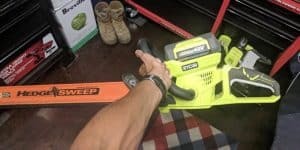 Because it was made to reach long distances, it has a 59” shaft, allowing you an extra 6’ of reach so that you can have the utmost in trimming maneuverability. Like the other models, it is made with the Redmax patented Strato-Charged design.